05/05/2012 - The Italian dominion shown yesterday in qualifying continued in the races of the Italian Formula 3 European Series. In race 1 Eddie Cheever started from the pole position and set the pace throughout the 22 minutes plus one lap of the race, keeping at his back Riccardo Agostini. 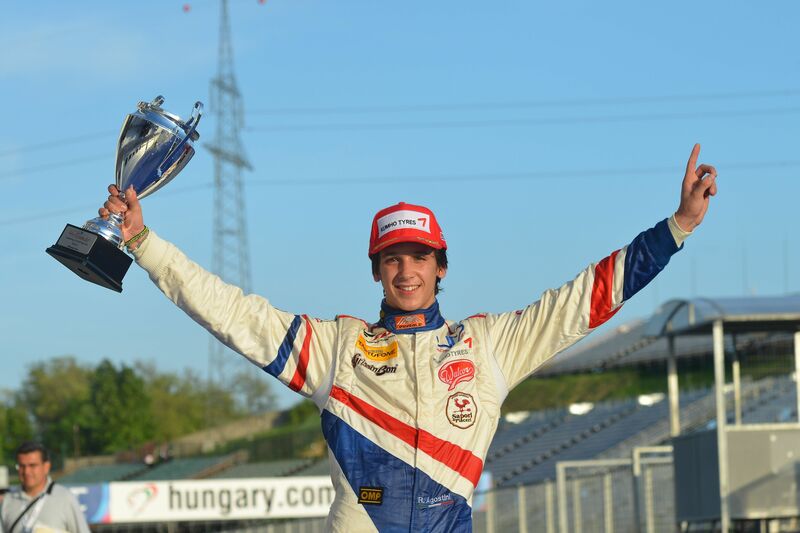 Race two at Hungaroring saw instead Agostini taking his Mygale on the top step of the Italian Formula 3 podium after the victory of the Mexican Pablo Sanchez Lopez in 2009 in Monza with the Mygale of Alan Racing. Race one was troubled for Henrique Martins that had a problem to the axle shaft of his Dallara during the formation lap and had to get back into the pits to start only after two laps. At turn one, Brandon Maisano (Prema Powerteam) was sandwiched between the pair of drivers of team Ghinzani, Gerard Barrabeig and Robert Visoiu. The Catalan and the French pupil of the Ferrari Driver Academy had the worst and were forced to end their race only a few corners afterwards. At the end of the race, behind Cheever and Agostini, the top step of the podium was obtained by Robert Visoiu (Ghinzani) who became the youngest driver to be on the Formula 3 podium as he is class 1996. The fourth and fifth position went to BVM pair made by Mario Marasca and Patric Niederhauser. Sixth was Sergey Sirotkin (Euronova), who was followed by Nicholas Latifi (BVM), Yoshitaka Kuroda (Euronova) and Henrique Martins (Prema Powerteam). In race 2, the Prema Powerteam trio ended behind Agostini, as Henrique Martins and Brandon Maisano ended on the podium and Eddie Cheever was fourth. Fourth was the Romanian driving for Ghinzani, Robert Visoiu, while Sergey Sirotkin was sixth again in this occasion. Seventh position for Gerard Barrabeig (Ghinzani) who was followed by the driver from Latina, Mario Marasca (BVM). The classification was ended by Nicholas Latifi (BVM) and Yoshitaka Kuroda (Euronova), as they had a contact during the race. Problems at the start forPatric Niederhauser (BVM) instead who managed to complete only one lap before retiring. Green lights to the sprint race will be at 10.15 (GMT+2) tomorrow, 15' + 1 lap, with live coverage on Rai Sport 2.